Nice clocks! I'm waiting until I get a new heatsink and some DDR2 800 RAM before I start overclocking, but since I broke my headphones, which I need to replace, it will be a while before I can really overclock my E6600. I have my 939 3200+ cruising at 2.35, but I haven't really tried to push it yet. Overclocking is nice, but too much aggravation for me to play with it much. 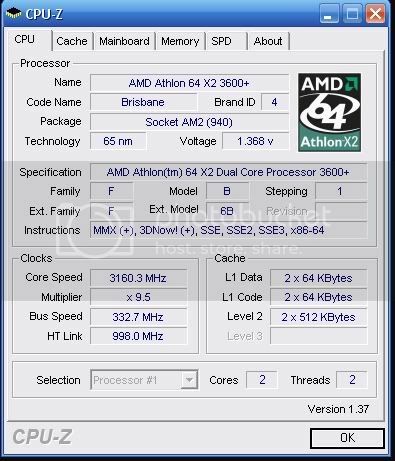 lol, i love that, everybody that i know that has an amd has alteast tried once to get past 3ghz. i myself was stufk at the limit at 2.83ghz...pretty good as i came from 2ghz stock. vernong, lower your ht multiplier to 2 and see if it will post. post a pic of your ram cpuz. what voltage do you have set in bios? BTW, frakin wicked oc, man. ok.. i'll do that when i get home.... still stuck at school..
also, are your temps reporting correctly? i havent flashed my 590 bios, don't know if i wanna...but core temp is reading below 20*c for both cores.. I've heard of people getting higher with that chip, keep trying. What is your Super PI times?